I’ll admit it: The military spouse in me is afraid. 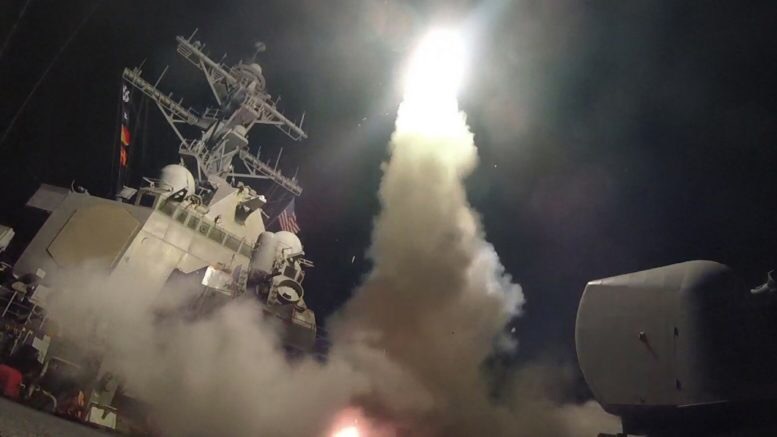 As 59 Tomahawk cruise missiles rained over Syria last night, my social media feed was filled with questions, and with fear. From, “Did we just go to war with Syria?” to, “So worried about my husband and all of our deployed military right now!”, our military families are left not knowing what to expect, or really even how to feel. But one thing I do know: It is time; we have — we had — to do something. On April 6, 2017, the United States launched an offensive strike targeting a Syrian military airfield in Homs, as a retaliation for the unspeakable horrors of the Assad regime (the latest being an alleged chemical attack that left over 100 dead). It’s a situation fraught with complexity. We don’t know if this will mean more, or sooner or longer deployments. We don’t know how Syrian President Bashar al-Assad (or Iran and Russia who back him) will respond. There is so much uncertainty, and in the absence of assurances, it’s easy to let fear and doubt creep in. I’ll admit, I’m scared of what this means for our collective future. But in the face of that fear, I keep coming back to the fact that somewhere in the corners of Syria, plagued by civil war and terrorism, is a regime intentionally killing its people. Let that sink in. Their government is killing their civilians, in the thousands. Innocent people — children — are being gassed to death. Yes, the milspouse part of me is scared. But the mommy in me, the American, the human being? Those parts of me are furious.